More than one quarter of pipo wey dem survey for areas wey Ebola dey worry inside Democratic Republic of Congo tell researchers say dem no believe say di disease dey exist. Some 36% of pipo wey respond to di survey also believe say di authorities na im dey fake di disease to cause confusion for di kontri or for dia for financial gains. Di authors of di study, wey dem publish for di Lancet, tok say dis trust wey pipo no get on top Ebola mata na part of di tins wey dey make di sickness still dey worry for di kontri up till now. 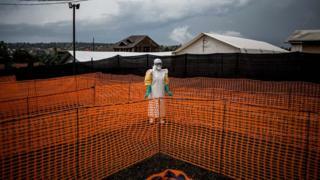 Di Ebola outbreak bin start for August and more than 600 pipo na im don die, according to di health ministry. More than 1,000 pipo na im don contract di virus during di current outbreak, wey be di second-largest ever wey dem don record. Di study survey 961 pipo for central di Congolese city of Beni and Butembo. According to di strudy, most of di pipo dem tok to don hear tok say di Ebola outbreak no dey exist, say na tori wey authorities make up to make money or to cause katakata for area. One in four of di pipo dem to believe di tori say Ebola no dey exist, while di higher number of di pipo believe say na story for di gods wey authorities make up because of money and to cause confusion for di region. Why Pipo no trust di authorities? BBC tori pesin, Gaius Kowene from di capital, Kinshasa report say di lack of trust don contribute to four violent attacks for Ebola treatment centres for di past month. "Di lack of trust combine wit di epidemic don really make pipo no wan follow advise, dem no wan listen to wetin authorities get to tell dem to prevent di spread of di epidemic," e tok. Local militia group dey active for di area and police plus soldiers dey always follow health workers for security reason. Dis one make villagers dey suspect, according to wetin Jean-Philippe Marcoux, wey be di kontri director for international aid group Mercy Corps tell Reuters news agency. Health Minister Oly Ilunga tell BBC say di authorities dey try to involve local communities more. Less than two-thirds of pipo wey dem ask kwesion for di surveysay dem go take vaccine for Ebola. Election officials blame di Ebola outbreak as di reason to cancel di December presidential elections for di regions wey di sickness affect.